Captain Laustit had only a few seconds left to make his decision. He was at two thousand feet past the airport and heading straight for Manhattan in the darkness. There was only one thing he could do. Other jets that night, landed with the help of the miracle of radio. In the subway, people were still coping. About after an hour, hour and a half people became very restless -it was not pleasant. It was not very congenial, but everybody felt scared. The NY subway trains stopped people were trapped in the dark. After about an hour and a half of this train employees would pass outside but not look in and not answer when people banged on the windows and called out they just ignored them. Gradually…finally…People began to realize where they were. Lost under the ground. Helpless. Unless help came. A major power black out Con Edison was down and it affected the entire city. Hours after the train stopped train began to empty and all the passengers walk out singly upon the catwalk. A few days later, people were back at their daily routine as if it had never happened. 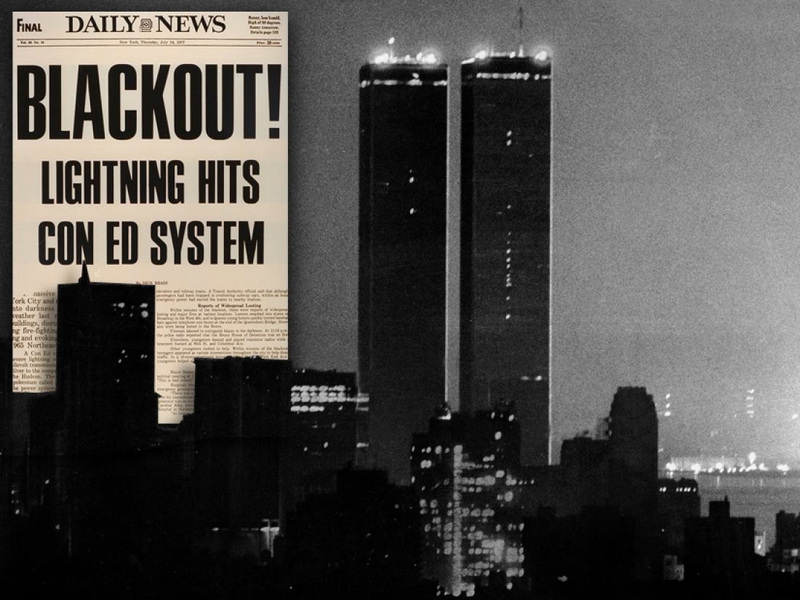 The events leading up to the blackout began at 8:37 p.m. EDT on Wednesday, July 13 , 1977 with a lightning strike at Buchanan South, a substation on the Hudson River, tripping two circuit breakers in Buchanan, New York. The Buchanan South substation converted the 345,000 volts of electricity from Indian Point to lower voltage for commercial use. A loose locking nut combined with a slow-acting upgrade cycle prevented the breaker from reclosing and allowing power to flow again. A second lightning strike caused the loss of two 345 kV transmission lines, subsequent reclose of only one of the lines, and the loss of power from a 900MW nuclear plant at Indian Point. As a result of the strikes, two other major transmission lines became loaded over their normal limits. Per procedure, Consolidated Edison, the power provider for New York City and some of Westchester County, tried to start fast-start generation at 8:45 p.m. EDT; however, no one was manning the station, and the remote start failed. At 8:55 p.m. EDT, there was another lightning strike at the Sprain Brook substation in Yonkers, which took out two additional critical transmission lines. As before, only one of the lines was automatically returned to service. This outage of lines from the substation caused the remaining lines to exceed the long-term operating limits of their capacity. After this last failure, Con Edison had to manually reduce the loading on another local generator at their East River facility, due to problems at the plant. This made an already dire situation even worse. At 9:14 p.m. EDT, over 30 minutes from the initial event, New York Power Pool Operators in Guilderland called for Con Edison operators to “shed load.” In response, Con Ed operators initiated first a 5% system-wide voltage reduction and then an 8% reduction. These steps had to be completed sequentially and took many minutes. These steps were done in accordance with Con Edison’s use of the words “shed load” while the Power Pool operators had in mind opening feeders to immediately drop about 1500 MW of load, not reduce voltage to reduce load a few hundred MW. At 9:19 p.m. EDT the final major interconnection to Upstate New York at Leeds substation tripped due to thermal overload which caused the 345kV conductors to sag excessively into an unidentified object. This trip caused the 138 kV links with Long Island to overload, and a major interconnection with PSEG in New Jersey began to load even higher than previously reported. At 9:22 p.m. EDT, Long Island Lighting Company opened its 345 kV interconnection to Con Edison to reduce power that was flowing through its system and overloading 138 kV submarine cables between Long Island and Connecticut. While Long Island operators were securing permission from the Power Pool operators to open their 345 kV tie to New York City, phase shifters between New York City and New Jersey were being adjusted to correct heavy flows, and this reduced the loading on the 115 kV cables. The Long Island operators did not notice the drop in 115 kV cable loadings and went ahead with opening their 345 kV tie to New York City. At 9:24 p.m. EDT, the Con Edison operator tried and failed to manually shed load by dropping customers. Five minutes later, at 9:29 p.m. EDT, the Goethals-Linden 230 kV interconnection with New Jersey tripped, and the Con Edison system automatically began to isolate itself from the outside world through the action of protective devices that remove overloaded lines, transformers, and cables from service. Con Ed could not generate enough power within the city, and the three power lines that supplemented the city’s power were overtaxed. Just after 9:27 p.m. EDT, the biggest generator in New York City, Ravenswood 3 (also known as “Big Allis“), shut down and with it went all of New York City. By 9:36 p.m. EDT, the entire Con Edison power system shut down, almost exactly an hour after the first lightning strike. By 10:26 p.m. EDT operators started a restoration procedure. Power was not fully restored until late the following day. Among the outcomes of the blackout were detailed restoration procedures that are well documented and used in operator training to reduce restoration time. THE NIGHT NEW YORK BECAME A TRAP. This is one of the more perfect examples of the kind of technological trap that we set for ourselves: The lift, the elevator.I mean, what is it? It’s a steel box with some buttons in it and maybe a trap door for emergencies. But who ever looks that close? Except when this happens. Where is it? And even in this situation — closed in, with an escape route that we can’t handle. We behave like many of those New Yorkers did. We – strike a light – and we look around to see how badly things are. And if we find, in this case, an emergency button -Absolutely great! we sit back and we wait for help to come. We wait for technology to come back and save our lives. Because it’s inconceivable that it won’t– isn’t it? I mean, if you admit that, you’ve got to admit that every single day of your life in some form or other you unconsciously walk yourself into a technology trap. Because that’s the only way to live in the modern world. So you don’t admit it, you say: Oh well, in this situation – we’ll cope. But what happens……when the effects become widespread? Irreversible? Devastating? What happens when what little resources you have to help you cope……give up? Then what? Well, in all the disaster scenarios you read what happens is that without power technologically based civilization cracks up rapidly. Without enough auxiliary power and most major cities don’t have it. organization is impossible. It’s every man for himself, looting and arson follow and in a city not prepared to be a fortress, supplies run out – fast. And, however frightening the thought of leaving your technological womb, sooner or later there is nowhere to go, but out. Away from the danger. The minute you decide to move you’re on your own. In a way that no modern century city dweller has ever been in his life. And then the traps begin to close. To start with, do you even know where to go in order to survive? Did you manage to get a map before you left? And if you did – how do you get out? Walk? Drive until you run out of fuel? Are you ahead of the millions of other people pouring down these roads trying to do just what you’re trying to do? And if they catch up with you -have you got something they need? And if you have, can you protect yourself? Did you bring enough food and drink to last as long as necessary? And if you didn’t – where will you get it? Steal? How far out will you have to push on until you’re far enough out to be safe? And, can you be sure that’s far enough? And even if, by some miracle, you finally make it do you know enough to recognize the place to stop when you see it? I mean…what does survival without technology look like? There’ll be no signs up. So, let’s say that finally somewhere far out into the country you come across a place that looks right.And let’s say you’ve had the good sense and good luck to look for a farm. Because that’s where food comes from, doesn’t it? Okay, so its a farm so you decide to stop. Has anybody got there first? Or – are the owners still here?Because you’re going to need shelter,and people don’t give their homes away. They barricade themselves in. So – sooner or later – exhausted and desperate you may have to make the decision to give up and die. Or – to make somebody else give up and die because they won’t accept you in their home voluntarily. And what -in your comfortable urban life -has ever prepared you for that decision? Ok, lets say by some miracle the place is empty and it’s all yours -Is there enough food in the house? How long will it last? How will you cook it? Wood fires? Are you fit enough to chop all the wood you’ll need before winter comes? If you’re lucky, you’ve got livestock on the farm. Great! Meat. But can you slaughter – and bleed – and butcher an animal? Ok, supposing you manage that -You’ve got enough meat to eat, until you’ve eaten all the cows. But at least you could start running your farm. But it’s a modern farm, remember? It’s mechanized. There’s a gasoline pump but it’s empty. So you can’t use……the tractor. What you need is a horse and cart. But when did you last see a horse and cart on a modern farm? And everything else here….the saw, the power drills, the light, the sterilizer, the water supply, the sewage system,the hoist, the milking parlor, the pumps,and everything on this control panel demands the one thing you don’t have: Electric power. Everything that you’ve found on this farm- doesn’t work. The place is a trap. But there’s nowhere else to go. The only way you’re going to survive is if you find the one thing you need to keep on providing the food you’ve gotta have. And you don’t need a mechanized version of that thing. You need….the kind… people haven’t used in a hundred years…Ah! You need THAT kind of plow. You’re saved! Or are you? Because what it comes down to at this point is this: Can you use a plow? And here you are with the biggest miracle of all: a plow and animals to pull it. So, maybe after a few days of fumbling around with the harnesses and the bits and pieces you manage to yoke up the oxen and plow the land. Then, and only then, can you say that you have successfully escaped the wreckage of technological civilization and lived off the land, and survived. If you know how to use the furrow you plow! I mean, can you tell the difference between an ear of corn and a geranium seed? Do you know when to so whatever it is you think it is? Do you know when to harvest it and eat the bit that you think isn’t poisonous? I mean, it’s no accident that the chain of events triggered off by that relay in power station back there in Niagara Falls ends here with the plow. The relay itself doesn’t matter. I mean, any one of a million things could fail and cause our complex civilization to collapse for an hour, for a day -however long. Because that’s when you find out the extent to which you are reliant on technology and don’t even know it. That’s when you see that it’s so interdependent – you take one thing away and the whole thing falls down and leaves you with nothing. Unless you can plow and survive and start the whole process off again from scratch. And it’s no accident that to do that you have to have a plow.Because it was the plow that triggered everything off a long way back in the past. After a different set of people also found out that their comfortable life -was falling apart.In a world where events came to a point where a fundamentally new way of life had to be found. The above is a printed version of James Burke’s most well-known series “Connections” which explores the surprising and unexpected ways that our modern technological world came into existence. Each episode investigates the background of usually one particular modern invention and how it came into being. These explorations are an attempt to locate the “connections” between various historical figures who seemingly had nothing to do with each other in their own times, however once connected, these same figures combined to produce some of the most profound impacts on our modern day world; in a “+=” type of way.